Randy Herlein was 51 when he traveled from his home in western Michigan to Rochester to receive treatment for a rare form of bone cancer. That treatment ultimately involved having his right leg amputated. And as he lay in a hospital bed at Mayo Clinic Hospital's Saint Marys campus one day after surgery, Randy struggled with where to go from there. "I started thinking, 'Now what am I going to do?'" Randy tells us. "'Everything that I do, everything that I want to do, requires two good legs. How is this going to work out?'" A few days later, as he began his rehabilitation program, physical therapist Marlene Einertson helped Randy put his life into perspective. "She told me, 'Randy, you're going to find your new normal,'" he says. Before his cancer diagnosis in 2009, Randy's "normal" life was that of an outdoorsman. He hunted. He fished. He hiked. He wondered if any of that would be possible again. Then Randy's thoughts turned to a family vacation that had included a short stop at the Grand Canyon. And a goal was born. Randy decided that if he could make it to the bottom of the Grand Canyon and back up again on a prosthetic leg, that would be his sign. "I told myself that was when I'd know I was going to be OK," he says. 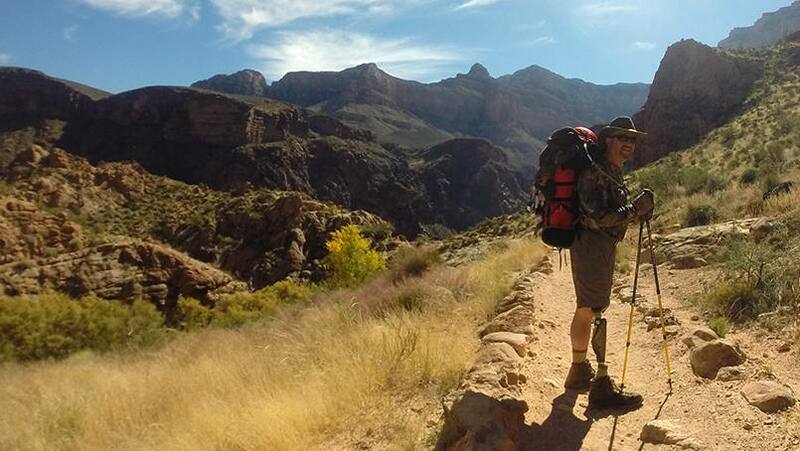 So after being fitted with a prosthetic leg and receiving the green light from his care team, Randy began training for a hike that would take him down the canyon's Bright Angel trail. Half-way through his training, Randy added one more piece to his adventure. "I decided that it was selfish of me to do this for myself," he tells us. "So I made it a fundraiser for the American Cancer Society." Randy did that by selling personalized, color-coded ribbons to anyone whose life had been affected by cancer. And in the fall of 2014, he tied 419 ribbons to his backpack and set off down the trail. "I honestly felt like all of the people on the ribbons were there with me," Randy tells us. "It was pretty emotional." It was emotional, too, when Randy and the small group of friends who'd accompanied him on his hike neared the canyon's rim five days later. "There were some people who had figured out that I'd been in the canyon for a while," Randy says. 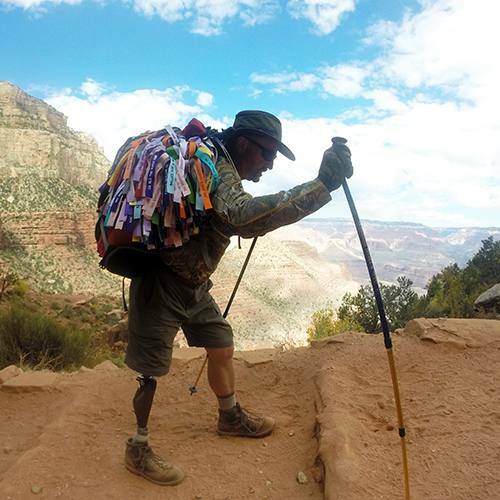 "They saw that I had a prosthetic leg and all of these ribbons tied to my pack, and so when I stepped back up over the top of the rim, they all started cheering. I've never had a feeling like that before in my life." When he returned home, Randy tells us the first thing he did was send a personalized video message and thank-you card to each member of his care team at Mayo Clinic for the role they'd played in making it happen, along with the "caregiver" ribbons they'd each purchased from him before his hike. "Dr. Karen Andrews, Dr. Scott Okuno, Dr. Franklin Sim, Dr. Courtney Sherman, Marlene Einertson … they all had a big part in this," Randy says. "I wanted them to know how much I appreciate everything they've done for me, and for helping me to see that life as I knew it didn't need to end just because I'd lost a leg." Be a big part of our story by sharing your comments below and by sharing this story with others.